The 1972 was the year which no-one went out in Northern Ireland. We had a population explosion, coinciding with the bombs and the bullets, the people stayed home and had babies. Bloody Sunday happened in January 1972 and by the end of that year we had the privilege of being born in the year with the highest number of deaths in the entire troubles, before and after. and that although there was no proof that any of the deceased had been shot while handling a firearm or bomb, there was a strong suspicion that some had been firing weapons or handling bombs in the course of the afternoon. 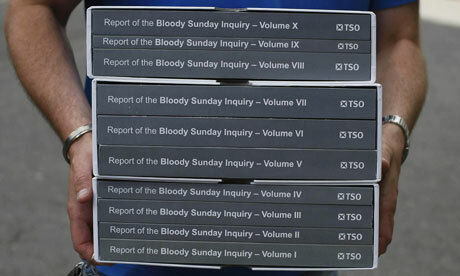 The Widgery report was a whitewash. 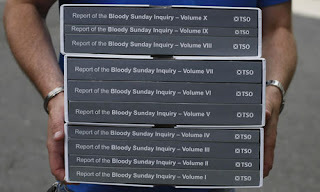 In 1998, Prime Minister Tony Blair, established the Bloody Sunday Inquiry chaired by Lord Saville. Today his report was published by the Secretary of State for Northern Ireland and released after a statement by Prime Minister David Cameron. • Northern Ireland's Deputy First Minister Martin McGuinness, Sinn Fein, was present at the time of the violence and "probably armed with a sub-machine gun" but did not engage in "any activity that provided any of the soldiers with any justification for opening fire"